Well keeping with our posting theme today on slow cooking I thought I would share an easy great slow cook recipe for a Sunday evening dinner – The Whole Chicken. 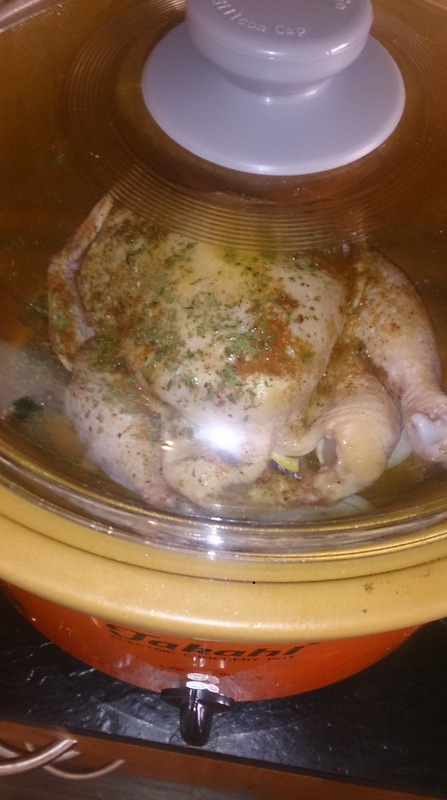 A Whole Chicken put into the Slow Cooker to work its magic! So how do you slow cook a whole chicken? See below for what I do there are many recipes on the web similar or different that you can Google but this just gives you an understanding of the process and flavors we like in our house. – Pat dry your chicken and ensure it is cleaned of all giblets set aside on a plate. – Mix together your dried herbs and spices into a small bowl. – Slice onions into medium sized rounds and cover the bottom of your slow cooker pot this will form the base for your chicken to sit. – Place 3 of your cut lemon wedges into the chicken cavity. Leave one wedge leftover to squeeze on top of the chicken. – Place the dried herb rub all over your chicken top and bottom. – Put chicken into the slow cooker on top of the onions. – Drizzle lemon juice and tablespoon of olive oil over your chicken. – Close the lid and set on low for eight hours I feel and have been told by many a slow cooker experts this gives best results. You may see some say set on high 4 hours etc… but it isn’t quite the same. ‹ Cook Slow – Live Fast and Get Healthy! The lemon inside the chicken is a great trick, isn’t it? It really is 🙂 thank you for stopping by and leaving us a comment! I stopped by and checked out your BLOG at http://sybaritica.me/ I just signed up to follow & look forward to your updates.